As per the official notifications issued by Police Headquarters of various States there are 6563 vacancies of Constable, ASI and SI at different Police Forces. Candidates who aspire to be a part of Police Force can apply through the prescribed format. If you are willing to join the Police Forces then this is the right time for you! 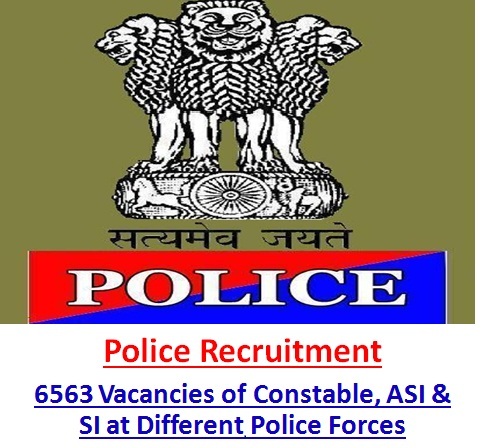 As per the official notifications issued by Police Headquarters of various States there are 6563 vacancies of Constable, ASI and SI at different Police Forces. Candidates who aspire to be a part of Police Force can apply through the prescribed format. According to the notifications issued by Police Headquarters of States like: Jammu & Kashmir, Jharkhand, Punjab, Rajasthan and Punjab there are 6563 vacant positions for Constable, ASI and SI. All those candidates who are interested and meet the eligibility criteria norms issued by police departments can apply for Police Jobs. This is a big time opportunity for all candidates especially for the ones who are willing to pursue job in Northern India. As mentioned above, the vacancies for Constable, ASI and SI Jobs are available at Jammu & Kashmir, Punjab, Rajasthan and Punjab covering the northern part. Vacancies are also open in Jharkhand State which covers the eastern part of India. Candidates who are matric pass/intermediate pass/holding graduate degree/diploma (as per the norms of organization/department) are eligible to apply for the vacant posts. Please note that before filling-in application for Constable Jobs, ASI Jobs or SI Jobs, you must go through the all the necessary details. Please go through the table below to view the complete notification of 6563 Vacancies of Constable, ASI & SI at Different Police Forces. All those candidates who are interested and meet the eligibility conditions to apply for Constable Jobs, ASI Jobs or SI Jobs, can apply through the prescribed format along with necessary documents on or before the last date of application.